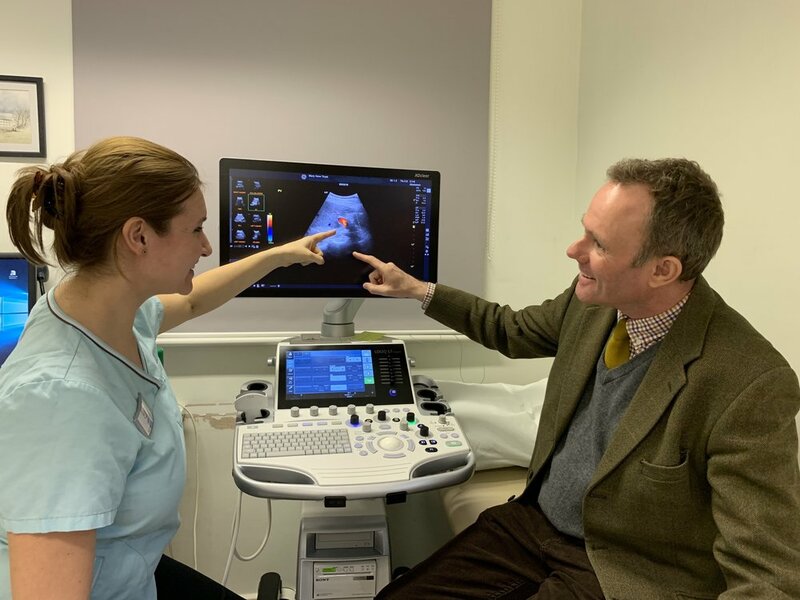 Arundel & South Downs MP Nick Herbert visited the Mary How Trust in Pulborough on Friday (11 February) to see their new ultrasound equipment which supports early cancer detection screening. Wednesday 4 February marked World Cancer Day and highlighted the need for urgent action to increase early stage cancer detection and diagnosis. The Mary How Trust for Cancer Prevention is a local charity which provides screening for early signs of serious illness including bowel and prostate cancers, heart disease and diabetes. Mr Herbert is a Patron of the Trust which celebrated its 30th anniversary last year. The Trust has been running a successful fundraising campaign ‘£30 for 30 years’ to upgrade its facilities. The first fundraising goal of £30,000 has already been met for a new ultrasound machine. The latest technology provides clearer imaging and is a key tool in the Trust’s screening programme. Mr Herbert met one of the Trust’s sonographers, Steph Easen, who demonstrated the ultrasound machine. Steph explained how the new technology meets the challenges of screening people with higher than average BMIs and gives her an improved picture of soft tissue organs. The Mary How Trust does not charge for their service but asks for a donation based on ability to pay. This is why ongoing fundraising is vital for the Trust to enable them to check 1,000 people a year. Phase 2 of the ‘£30 for 30 years’ appeal will support the purchase of diagnostic supplies. Mr Herbert said: “It is always a pleasure to visit the team at the Mary How Trust and to see the latest developments. 1. Photograph: Nick Herbert with sonographer Steph Easen demonstrating the new ultrasound scanner. 2. To read more about World Cancer Day see https://www.worldcancerday.org/. 3. To read more about the Mary How Trust for Cancer Prevention see https://www.maryhowtrust.org.